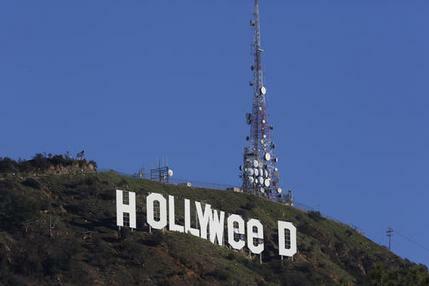 LOS ANGELES (AP) — Days after a prankster scaled a fence and altered the iconic Hollywood sign to read “HOLLYWeeD,” the agency that maintains and secures landmark said it will explore boosting security. Chris Baumgart, chairman of the Hollywood Sign Trust, said he plans to meet with police officials to be debriefed on the matter and explore ways to prevent similar acts. Police began investigating after a person used giant tarps to turn two of the iconic sign’s white O’s into e’s sometime on New Year’s Eve or early New Year’s Day. The prankster, dressed in black, was recorded by security cameras and could face a misdemeanor trespassing charge, officials said Sunday. However, police have called off a search for suspects. Investigators determined the sign had not been damaged, police spokesman Sal Ramirez said. The person scaled a protective fence surrounding the sign above Griffith Park and then clambered up the giant letters to drape the coverings, officials said. In 2014, the city replaced an old T-bar gate with a wrought-iron fence to keep trespassers out of the park and away from the Hollywood sign at night. In recent years, residents in adjacent Beachwood Canyon have pushed to close access to the sign. They complain that tourists, hikers and motorists clog the narrow, winding road leading to the sign. About 35 cameras are positioned to monitor the sign and surrounding areas, and a police officer sits in a guard house around the clock, Baumgart told the newspaper. The prank may have been a nod to California voters’ approval in November of Proposition 64, which legalized recreational marijuana, beginning in 2018. Hikers and tourists in the hills spent Sunday morning snapping photos of themselves in front of the altered sign before park rangers began removing the tarps. Forty-one years earlier to the day – Jan. 1, 1976 – a college student similarly altered the sign, using curtains to make it read “HOLLYWEED.” His change coincided with the first day that California classified possession of up to one ounce of marijuana as a misdemeanor, rather than a felony.